Bellator brings another strong card to The Forum in Los Angeles, California on Saturday night, with the main event featuring MMA legend Fedor Emelianenko and Bellator light-heavyweight champion Ryan Bader fighting for the vacant Bellator heavyweight championship in the finals of the Heavyweight Grand Prix tournament. The Grand Prix began in January 2018 and featured plenty of notable fighters including: Frank Mir, Roy Nelson, Rampage Jackson, King Mo Lawal, Matt Mitrione, and Chael Sonnen. 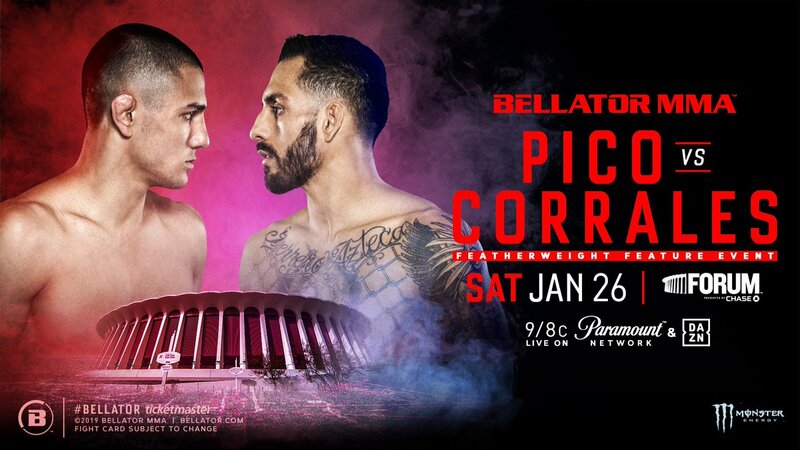 In the co-main event, rising MMA star Aaron Pico looks to continue his winning streak as he takes on Henry Corrales in a featherweight bout. Bellator 214 also marks the MMA debut of Jake Hager, who’s best known for his time as a professional wrestler, where he went by the name Jack Swagger in the WWE. Hager will look to follow in the footsteps of fellow pro wrestlers Brock Lesnar and Bobby Lashley, who achieved success in MMA as opposed to CM Punk, who wasn’t as fortunate during his stint in the UFC. Hager’s debut could be great for Bellator because they may draw more pro wrestling fans to their product and as a result, gain more popularity amongst casual fans or fans of both pro wrestling and MMA. After a calendar year of fighting a who’s-who of MMA legends, ‘The Last Emperor’ Fedor Emelianenko will look to add another heavyweight championship to his resume when he takes on reigning Bellator light-heavyweight champion Ryan ‘Darth’ Bader for the vacant Bellator heavyweight championship. If Fedor is able to defeat Bader, it’ll further add to his legacy in the sport as one of the greatest heavyweights of all-time. Bader will look to make some history of his own by becoming a two-division champion in Bellator like Daniel Cormier did in the UFC, when he defeated Stipe Miocic in July 2018. It would also put Bader in an interesting position because he hasn’t defended his light-heavyweight title since entering the Grand Prix, so he would most likely have to decide whether to stay at heavyweight or vacate the light-heavyweight championship should he walk out The Forum as a dual-champion. 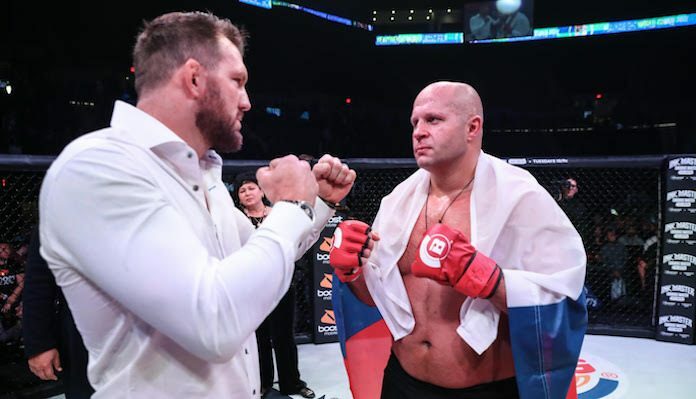 Although Fedor is 42, he still possess the ability to knockout his opponents at any moment, which was seen in the opening round against Frank Mir and again in the semi-final against Chael Sonnen. He has been able to turn back the clock in this tournament, but he'll have his hands full against Bader, who like Sonnen is able to utilize his wrestling skills and cause problems for his opponents. Even though Fedor has won in impressive fashion, I still believe Bader will come out the winner. Sonnen was able to take Fedor down a few times in the semi-final and even had him in a favorable position on the ground. Bader is known for his wrestling and takedowns, so if he follows a similar strategy, I think he’ll be more successful in finishing the fight. Aaron Pico has been on a tear in Bellator ever since his debut loss to Zach Freeman at Bellator 180 in New York City. That loss as proved to be the best thing to happen to him because it took away all the pressure and hype that surrounded him when he signed with Bellator. Since the loss, Pico has won four straight fights in the first round; he defeated Justin Linn by KO at Bellator 183, Shane Krutchen by TKO at Bellator 192, Lee Morrison at Bellator 199, and former bantamweight contender Leandro Higo by TKO at Bellator 206. Henry Corrales also comes into this fight with a four-fight win streak that includes wins over Cody Bollinger, Noad Lahat, Georgi Karakhanyan, and Andy Main. Corrales will be a tougher test than Higo was in that the majority of his fights have been contested at featherweight as opposed to Higo, who moved up from bantamweight to fight Pico. Corrales is also the much more experienced fighter; MMA record 16-3, and will want to use that to his advantage when he fights Pico, who’s never fought past the first-round. Pico is truly the total package in terms of what he problems he poses to his opponents. He has competed in boxing and wrestling since he was twelve-years -old and has a decorated background in both forms of competition. Pico’s background in boxing and wrestling is significant because he can hold his own both in standup and on the ground should the fight go there. With the win, Pico could rise up the ranks in Bellator’s featherweight division and potentially get an opponent ranked in the top-10 for his next fight. Another highly anticipated fight on this card takes place in Bellator’s heavyweight division, where Jake Hager makes his Bellator MMA debut against JW Kiser. Hager officially signed with Bellator in November 2017 and since then, there has been speculation as to when and where he’d be making his debut and who the promotion would match him up with. Unlike Aaron Pico, Bellator decided to match Hager with a JW Kiser, who’s relatively unknown in MMA and has a pro record of 1-1, which is a good first opponent for a fighter who’s never competed in the sport before. When the announcement was made that Hager would be fighting for Bellator, many fans speculated whether Hager will turn out like CM Punk or Brock Lesnar. Both Punk and Lesnar were tested immediately when they made their UFC debuts, but it was Lesnar who achieved the most success when he defeated UFC Hall of Famer Randy Couture to become the UFC heavyweight champion in just his fourth professional fight. Similar to Lesnar, Hager was a standout as an NCAA Division I college wrestler at the University of Oklahoma; he was a Collegiate All-American in 2006 and holds the single-season record for most pins in the 285lbs division at the University of Oklahoma. After a successful college wrestling career, Hager signed with WWE, where he had a successful career as a pro wrestler; he won the ECW championship, WWE United States Championship, 2010 Money in the Bank, and WWE World Heavyweight Champion. In 2009, Hager was ranked #18 on Pro Wrestling Illustrated’s list of top-500 singles wrestlers in the world. I believe Hager will be successful in his MMA debut. He has an impressive NCAA wrestling background and his athleticism will allow him to shoot for takedowns much quicker. It’ll be interested to see if he tries to display what he’s learned striking-wise, but the safe bet would be for him to take the fight to the ground and finish Kiser early.